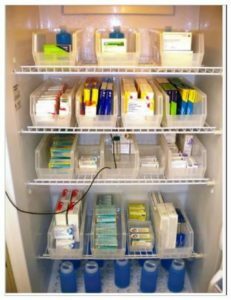 • System to enter vaccine shipments manually by selecting vaccines from drop down (enter Lot # /expiration date) or use a bar code scanner to enter inventory. • Ability to assign vaccines to either the office refrigerator or freezer. • A tool to perform a vaccine reconciliation (verify count) of doses in VaccineXpress vs. real refrigerator on a routine basis (e.g. Monthly or quarterly). • Ability to view use of each type of vaccine (commercial and VFC) for a selected time period.